a teenage driver is more than twice as likely to be involved in a crash than any other driver. Despite this, there are very real steps that young drivers and their parents can take to make driving safer. the risk of driving for teenagers. By far the biggest determinant of a teen’s likelihood of crashing is his or her behavior while driving. 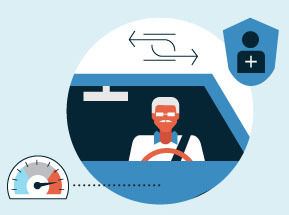 The driver has the capacity to make decisions that make driving riskier, or those that make it less so. The ubiquity of smartphones in the lives of modern teens has a major consequence on the safety of their driving. According to a study undertaken by AAA, 70% of teens admit to talking on a cell phone while driving and 50% of teens admit to reading a text message or email while driving. Putting a phone on silent is not sufficient when it comes to eliminating distractions; there still remains the temptation to check notifications or social media, especially when at a stop light. Along with being illegal, this is extremely dangerous. Instead, place your cell phone well out of reach when you enter the car. If you find yourself tempted to check it, place the phone in the trunk of the car. Think carefully about giving rides to your friends, especially if you know them to be a distraction. A further statistic worth knowing is that your chance of being killed in a car crash as a 16 or 17-year-old driver decreases by 62% when an adult aged 35+ is in the car. Older passengers are able to give advice on road conditions and potential hazards, and therefore anticipate dangers. Along with the distractions caused by other passengers, there is the near constant distraction from the car itself. Whether it’s blaring the radio, flicking between stations, or generally taking in sights and sounds on the route, it’s easy to lose concentration while on the road. Keep the radio at a low enough volume that it doesn’t become a distraction, and ask your passenger to be in charge of DJ-ing. If you’re in an unfamiliar location or are stressed by road conditions, then it is perfectly acceptable to ask your passengers for quiet or to turn the radio off. The statistics behind wearing a safety belt are well known. Along with ensuring that you don’t lurch forward in a crash, a safety belt will protect others within the car. Most states have very clear laws on wearing safety belts and will issue an instant ticket if you are caught without one. Especially important is making sure those in the back of the car wear a safety belt. If a crash were to take place, those in the back of the car would be thrown into the back of the front seats at a great force, often causing major bodily injury to the driver and front passenger. If you’re the driver, it’s in your self-interest as well as the law to make sure that your passengers have their safety belts on. Minimizing the in-car distractions are one part of being safer, but the manner in which a teen drives is equally important. The natural tendency for any new driver finally allowed out on the road is to go as fast as possible and enjoy their freedom. However, by taking the following steps, teen drivers can enjoy their freedom without taking unnecessary risks. Following these tips will make you far safer on the road. However, taking a defensive driving course will cement these skills in your daily driving. Additionally, it may lead to a reduction in your insurance rates, and the reduction of traffic ticket fines. According to the CDC, 1 in 10 teens drinks and drives, and 1 in 5 teen drivers involved in a fatal crash had some alcohol in their system; 81% of these drivers had blood alcohol content higher than the legal limit for adults (.08%). Young drivers are 17 times more likely to die in a crash when they have a BAC of .08% than when they have not been drinking at all. For this reason, many states have a zero tolerance policy when it comes to teens drunk driving, meaning that a BAC above a minimum threshold results in an automatic loss of license. Put another way, if you’re a teen, there is no safe drinking limit. If you’re driving, do not consume any alcohol or drugs. The big issue with speeding is that it increases the distance needed to stop the car, while also reducing the reaction time. According to the Children’s Hospital of Pennsylvania, in crashes where teen driver error was the cause, 21% were a result of the driver going too fast for road conditions. Speeding also makes it more likely that crashes will result in injuries. Most importantly, the research found that in some crashes caused by an excessive driving speed, the driver was not breaking the speed limit. Young drivers lack the experience to anticipate problems (such as going around a blind corner) and therefore may need to drive slower than the speed limit to be safe. Knowing how to respond to road conditions comes with experience. In some conditions, it’s simply not enough to obey the speed limit. For example, braking distance is significantly increased in heavy rain; visibility can be greatly diminished during fog or poor light; snow or ice can make controlling the car far more difficult. For teens, the best course of action is to drive with an experienced driver when conditions are new. If that is not possible (for example, when heavy rain comes on suddenly), driving as cautiously as possible will ensure that any dangers are minimized. 100 hours is not a magic number after which you will automatically become a safe driver. However, as a rule of thumb, logging 100 hours will mean that you have experienced most road conditions and incidents. If you are under 100 hours of driving, aim to have an experienced passenger with you where possible. Once you’ve hit 100 hours, you should be more experienced and proficient to go it alone (as long as you take heed of all the other tips in this guide). Choosing which car to buy for a teen can make a huge difference when it comes to safety. Buying a car capable of high speeds may be attractive for a teen, but the chances are it will encourage them to drive faster. Similarly, despite the perceived safety levels of sports utility vehicles, they have the capacity to roll over in crashes. Instead, choose a car that has a lower center of gravity. Antilock braking system (ABS). This system helps keep a car under control during extreme braking, and makes skidding less likely, particularly in slick or icy conditions. Daytime running lights. This will allow other road users to see the car at all times. This is particularly useful in poor lighting (such as dusk) when many teens fail to use their lights. Electronic stability control. This helps to keep a car under control at high speeds. According to the Insurance Institute for Highway Safety, ESC reduces rollovers by 70-88%. Adjustable head restraints. These are designed to minimize the impact of whiplash during a crash. These should be adjusted properly for the individual to have maximum effectiveness. Ensuring your vehicle is regularly maintained is crucial in keeping it running safely. Poorly maintained brakes and tires, for example, are a major risk and are likely to make it harder to control a vehicle in an emergency. Get your car serviced regularly to ensure that it’s running as safely as possible. This will also give you an opportunity to run through some last minute safety tips with your teen before they head off on their drive. As shown above, 100 hours is a useful rule of thumb when it comes to driving experience. Before your teen hits the 100 hours, you should regularly supervise your teen’s driving. This is especially true when it comes to new driving conditions, especially heavy rain, night driving, and icy conditions. Aim to be in the car the first time your teen encounters these conditions. Offering feedback can be the most trying part of the parent-child driving relationship. You should aim to give your teen regular communication about driving, albeit in a respectful and calm manner. Just as important as when you’re in the passenger seat is when you’re in the driving seat. You should aim to always set a positive example for your teen when you’re the driver. Think very clearly about how you would like your teen to drive, and aim to drive in a similar manner. In particular, think about your speed and your attitude to other drivers. Both of those can be bad habits that sneak into driver behavior – aim to start your teen off on the right foot. AAA has a StartSmart Parent-Teen Driving Agreement available for download. This is a quasi-contract between a parent and a child about driving privileges, rules, and consequences, and is signed by both parent and teen. This will set very clear boundaries to your child about what is expected of him or her when in the car. It also carries both rewards for driving safely and punishments for breaking the contract. Having a mature conversation with your teen, even if they are already driving alone, will go a long way to establishing clear boundaries, and to help your child understand how to become a responsible driver.